Inportant info about these vitamins: While Vitamin B1 is needed to metaboliza sugars (carbohydrates), Vitamin B2 si essential for the metabolism of fats, ketone bodies, carbohydrates, and proteins. Both vitamins playa key role in energy metabolism. Vitamin B2 is also needed to help the body change vitamin B6 and folate into forms it can use and is important for body growth and red blood cell production. How did I found out about the risk of developing Vitamin B1, B2, B6 deficiency? Why use synthetic vitamin supplements and not food rich in these vitamins? Because once you have developed vitamin B1 and B2 deficiency your body is not able to metabolize these vitamins from food rich in vitamins B1, B2 and B6. Why not Vitamin B-complex tablets? Do not opt for Vitamin B-complex tablets, as some synthetic vitamins from the B group (specifically Folate Acid which is also known as Vitamin B9) in a synthetic form should be avoided if you have cancer. Yet another reason to discuss vitamin deficiency with your doctor. Sadly, in my own experience vitamin deficiencies and post-chemotherapy hormonal disorders seem to have low priority. I hope that the increasing focus on immunotherapy as a viable treatment for cancer will bring the function of vitamins forward. Do not self-medicate, consult your doctor! Vitamin overdose is also dangerous! Vitamin B1, also called thiamine or thiamin, is one of 8 B vitamins. All B vitamins help the body convert food (carbohydrates) into fuel (glucose), which is used to produce energy. These B vitamins, often referred to as B complex vitamins, also help the body metabolize fats and protein. B complex vitamins are needed for healthy skin, hair, eyes, and liver. They also help the nervous system function properly, and are needed for good brain function. All B vitamins are water-soluble, meaning that the body does not store them. Like other B complex vitamins, thiamine is sometimes called an “anti-stress” vitamin because it may strengthen the immune system and improve the body’s ability to withstand stressful conditions. It is named B1 because it was the first B vitamin discovered. Thiamine is found in both plants and animals and plays a crucial role in certain metabolic reactions. Your body needs it to form adenosine triphosphate (ATP), which every cell of the body uses for energy. It’s rare to be deficient in thiamine, although alcoholics, people with Crohn’ s disease, anorexia, and those undergoing kidney dialysis may be deficient. Symptoms of thiamine deficiency are fatigue, irritability, depression and abdominal discomfort. People with thiamine deficiency also have trouble digesting carbohydrates. That allows a substance called pyruvic acid to build up in their bloodstream, causing a loss of mental alertness, difficulty breathing, and heart damage, a disease known as beriberi. All the B vitamins are water-soluble, meaning that the body does not store them. In addition to producing energy for the body, riboflavin also works as an antioxidant by fighting damaging particles in the body known as free radicals. Free radicals can damage cells and DNA, and may contribute to the aging process, as well as the development of a number of health conditions, such as heart disease and cancer. Antioxidants such as riboflavin can fight free radicals and may reduce or help prevent some of the damage they cause. Most healthy people who eat a well-balanced diet get enough riboflavin. However, elderly people and alcoholics may be at risk for riboflavin deficiency because of poor diet. 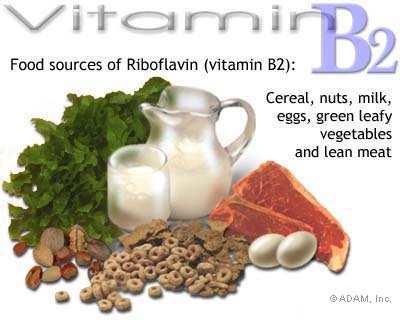 Symptoms of riboflavin deficiency include fatigue; slowed growth; digestive problems; cracks and sores around the corners of the mouth; swollen magenta-colored tongue; eye fatigue; swelling and soreness of the throat; and sensitivity to light. Vitamin B6, also called pyridoxine, is one of 8 B vitamins. All B vitamins help the body convert food (carbohydrates) into fuel (glucose), which is used to produce energy. These B vitamins, often referred to as B complex vitamins, also help the body metabolize fats and protein. B complex vitamins are needed for healthy skin, hair, eyes, and liver. They also help the nervous system function properly. It is rare to have a significant deficiency of B6, although studies indicate many people may be mildly deficient, especially children and the elderly. Certain medications can also cause low levels of B6 in the body. Symptoms of serious deficiency include muscle weakness, nervousness, irritability, depression, difficulty concentrating, and short-term memory loss.